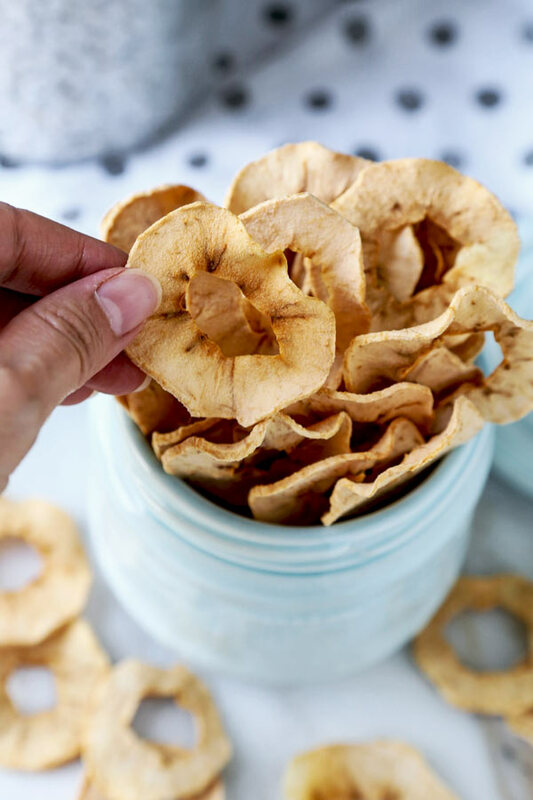 Crispy and fruity, homemade apple chips are an all natural healthy snack kids and adults love to eat! Only 2 apples are needed. Zero sugar. Low in calories. Low in fat. The perfect snack! For many of us this means pie and crumble season followed by apple cider and snow. There are so many delicious things that can be made with apples and every year I’m learning something new. This year I learned how to make apple chips! I used to get store bought apple chips but always found them to be kind of plain. That gave me the idea to make my own to see if I could come up with something better. And sure enough my first batch, though not perfect, tasted a million times better than the store bought version! That’s because I used my favorite type of apple – Honeycrisp. 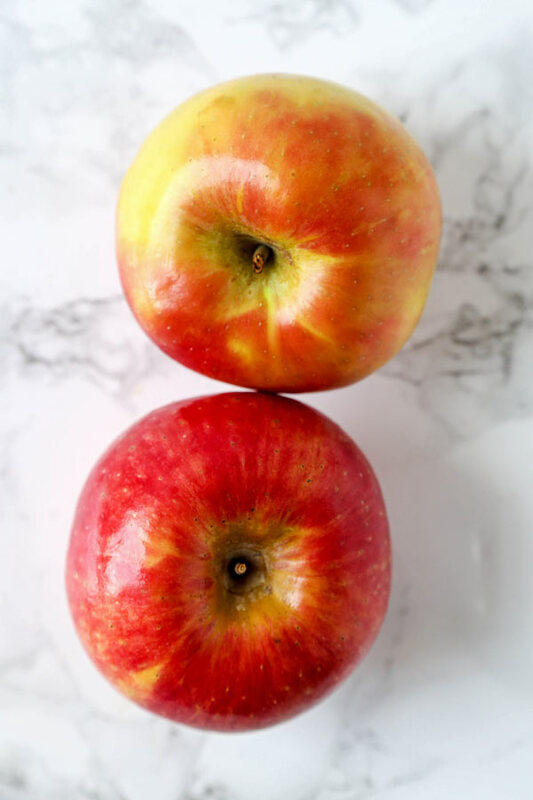 Honeycrisp apples are packed with flavor, both sweet and tart, and are very juicy. They are so tasty that no sugar or other seasoning needs to be added. They taste best on their own. I also peeled the skin off the apples as it gets unpleasantly tough when dried. This made a huge difference on a textural level and made the experience of eating apple chips, more pleasurable as a whole. Since then I haven’t bought a single bag of apple chips and I’m going to show you how easy they are to make! 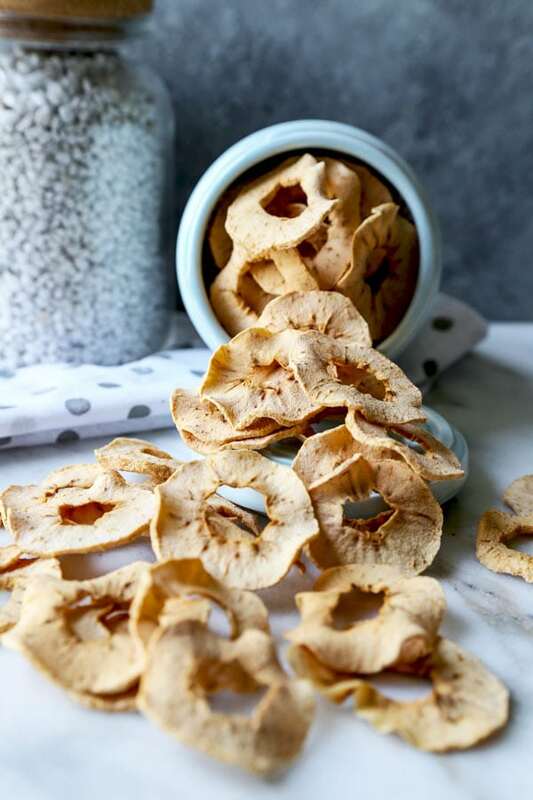 Making apple chips is extremely so simple you’ll wonder why you haven’t made them before! Start by preheating the oven to 200ºF. Peel the apple skin using a vegetable peeler or a knife and cut out the center. You can use an apple corer which is by far the easiest method. Another easy way to core an apple is to slice it in half from top to bottom and use a melon baller to scoop out the center part. You can see a tutorial here. The last method is with a paring knife and it’s the one I follow because I have neither an apple corer or a melon baller. Grab a paring knife and set the apple on a cutting board so the stem is facing up. Gently insert the blade around the center of the apple and push it all the way down, until you can feel the cutting board. Very carefully remove the knife and repeat this step three more times until you’ve created a square. Re-insert the knife in one of the cuts and slowly move the knife around to connect all the incisions. The goal is to be able to move the knife around in a circle. Put the knife down and push out the core with your thumbs until it pops out on the other end. I’ve seen a lot of apple chips recipes using cinnamon powder but I personally prefer mine without it. The very first time I made apple chips I used cinnamon and found that it gave the apple a strange smoky taste. I thought I had burned my chips in the oven but it turned out to be the cinnamon powder. Maybe I just had a bad experience but I wasn’t crazy about the taste. So if you are a cinnamon lover, my advice is to add it in the end, once the chips are baked. One of the things I love most about these apple chips is that they are 100% healthy. I can eat them knowing that I am being good to myself and my body and have nothing to feel guilty about. 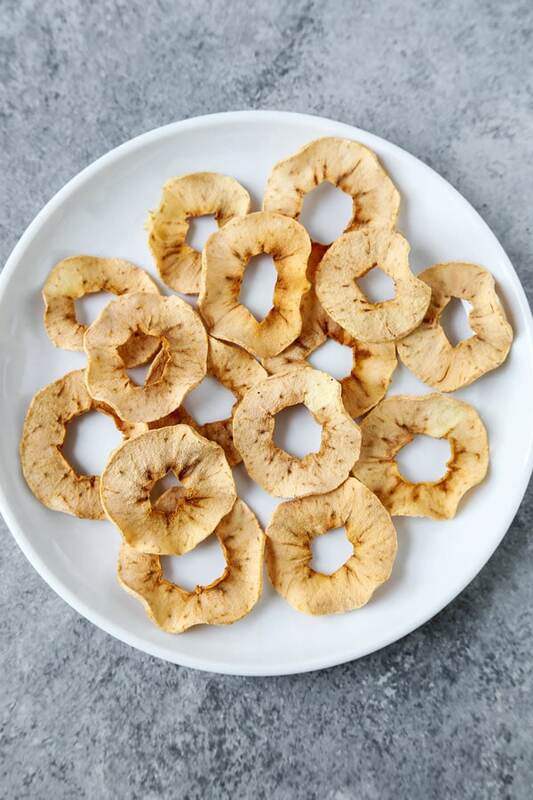 Some recipes sprinkle sugar on top of the apple slices to sweeten the flavor, but I believe that as long as you use high quality, tasty apples like Honeycrisps, you won’t need to add anything to them. So to answer the question of whether you should add sugar or not, my answer is no, don’t do it. 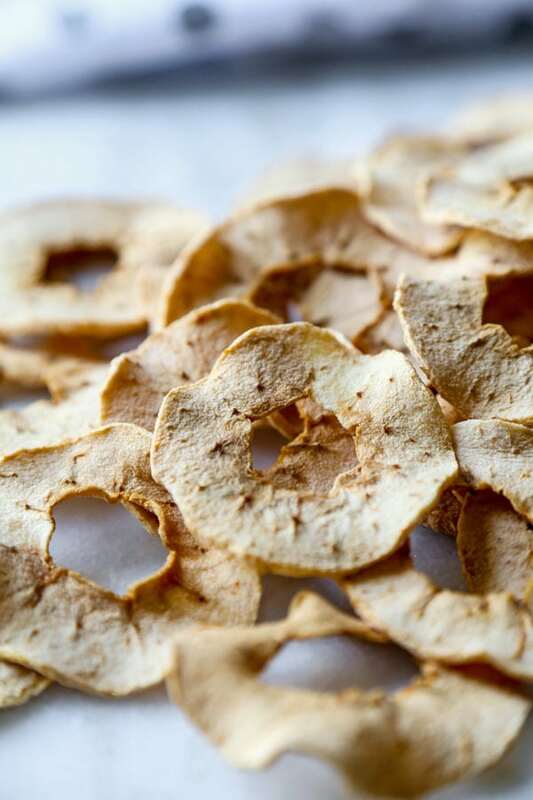 The baked apple chips are better and healthier without. Dehydration is the process of removing water from food by using heat. 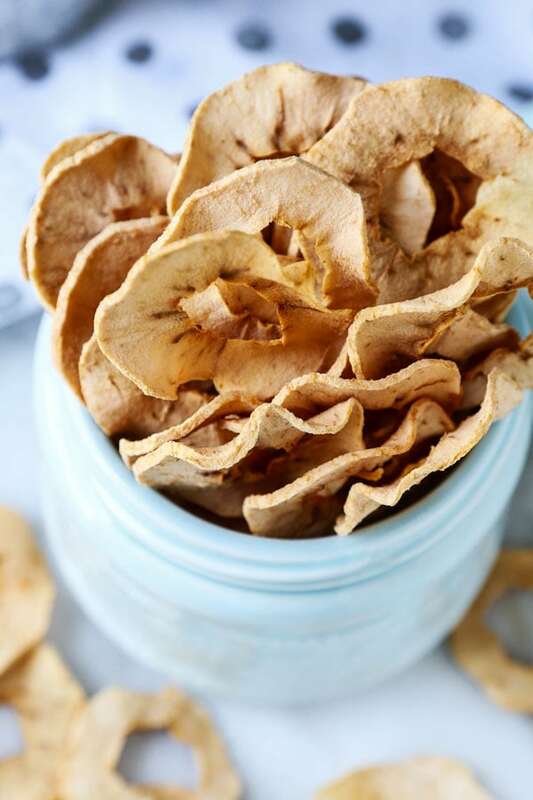 You can do this by dehydrating food outside under the heat from the sun, using an electric dehydrator or using an oven. I don’t recommend using the sun-drying method since temperatures and climates vary and can cause food to spoil. On the other hand both a food dehydrator and an oven can dehydrate food well and in similar ways. Unless you regularly dehydrate food, sticking to an oven will be just fine. The biggest difference between the two is the amount of energy one appliance uses versus the other. A food dehydrator is much more energy efficient than an oven because it’s a lot smaller and heats at a lower temperature. Another thing to keep in mind is that an electric dehydrator‘s temperature and air flow are always stable. This will produce food that’s been dried evenly and perfectly every time. An oven, however, can be tricky because it’s harder maintain constant temperature and airflow. One batch of dried goods may be better than another and the drying process may be uneven. It’s 100% natural which means you can feed your kids slices of health in abundance without them knowing its healthy! It doesn’t take up counter space. They are light and easy to carry in a purse as a mid-afternoon snack, or as an addition to a kid’s lunchbox. 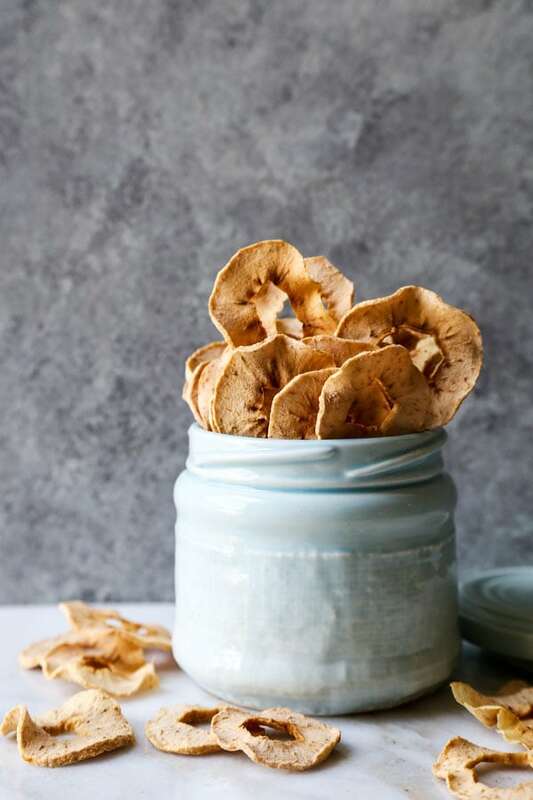 Just like regular chips, baked apple chips can turn stale if not properly stored. Keeping them in a dry space (I keep mine in the fridge) and in an airtight storage container, or Ziploc bag will ensure they stay crispy for 3-5 days. 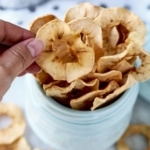 Did you like this Homemade Baked Apple Chips Recipe? Are there changes you made that you would like to share? A healthy snack that’s 100% natural. Peel, core and thinly slice the apples into 1/8 inch thick slices. Read the post for instructions on how to core an apple. Cover a large baking pan with parchment paper and place the slices on top in one layer. You may need to use more than one sheet pan to accommodate all the slices. 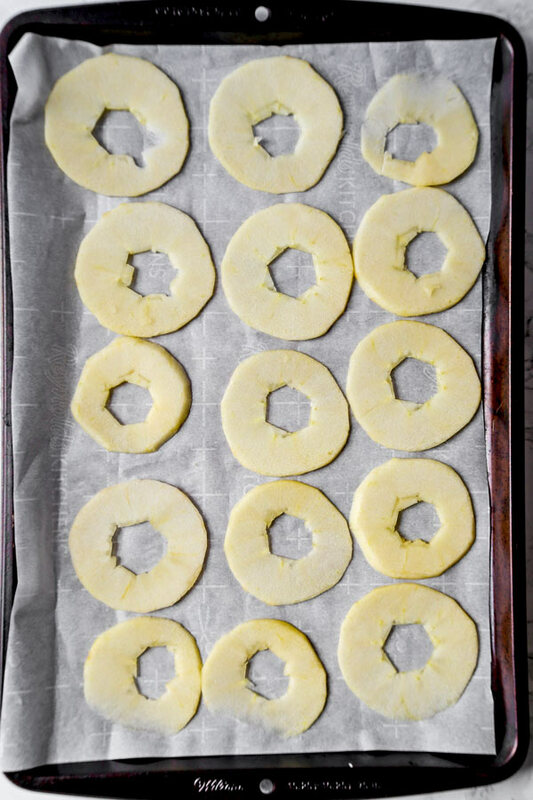 Put in the oven for 1 hours and turn the apple slices over. Bake for another 50-60 minutes. The longer you bake them, the crispier the slices will become.